Johann van Graan and Tyler Bleyendaal both praised Munster's young players after they ground out a narrow victory over the Dragons. In the mud at Rodney Parade, the raiders escaped with victory by the narrowest of margins in a contest which certainly won't make any Guinness PRO14 highlights reel. This success sent Munster back to the top of Conference A. "We knew this block would be massive for every team across Europe. We've qualified for the quarter-finals of the Champions Cup and we're now back top of our conference so the guys will take a well-deserved break now to recharge their batteries," said Munster head coach Van Graan. "I want to make a special mention for the whole squad. In these periods you need everyone to get you a result and it was fantastic to get a lot of guys like Bill Johnston some game-time. "They are the future of Munster. Scrum and lineout wise, I'll take that performance any day of the week. It was a tough game and Dragons threw everything at us, but I thought our composure in the last 10 minutes was excellent and Alby Mathewson was superb in controlling the game." Captain Bleyendaal added: "This was a young team with a lot of changes so this game was a new learning for a lot of them. I was happy with how we stuck at it. "It wasn't perfect and we probably gave up a few opportunities, but we got the points and we're delighted with that." Torrential Welsh rain worsened what was already a bare Newport surface and it meant free-flowing rugby was off the agenda. Instead it was a kicking and set-piece battle. In the second of those categories, Munster were faultless. They won all 18 of their lineouts which gave them a solid platform from which to boot for territory. That said, they didn't start well. Dragons prop Lloyd Fairbrother was driven over from close range and Josh Lewis converted with Munster yet to get going. Johnston kicked a penalty after being upended by Jared Rosser as the hosts went to the break with a 7-3 lead. In the second period, Munster turned it around to come out on top. 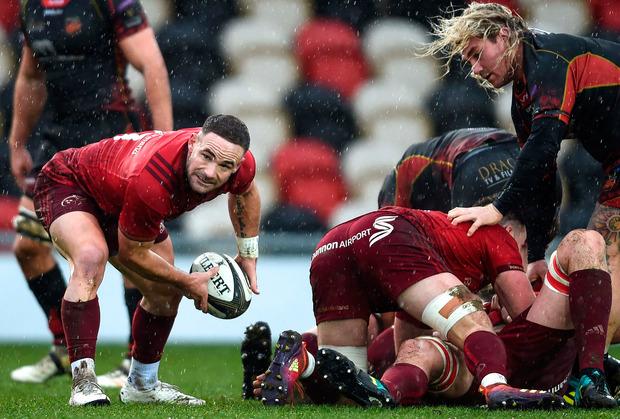 Munster dominated the second-half territory and forced Dragons lock Matthew Screech to bring down a driving line-out. His yellow card was crucial. 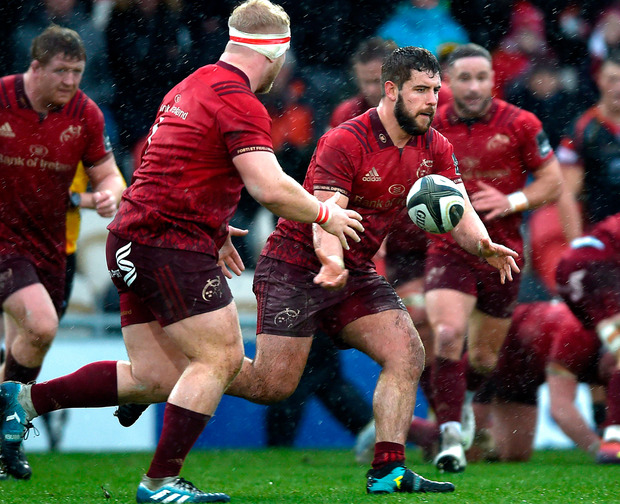 Van Graan's men pounded away for a try and finally came up trumps when Jean Kleyn powered over after Munster turned down several kicks at goal. It proved enough for victory as Lewis missed what would have been a match-winning penalty for the Dragons late on. 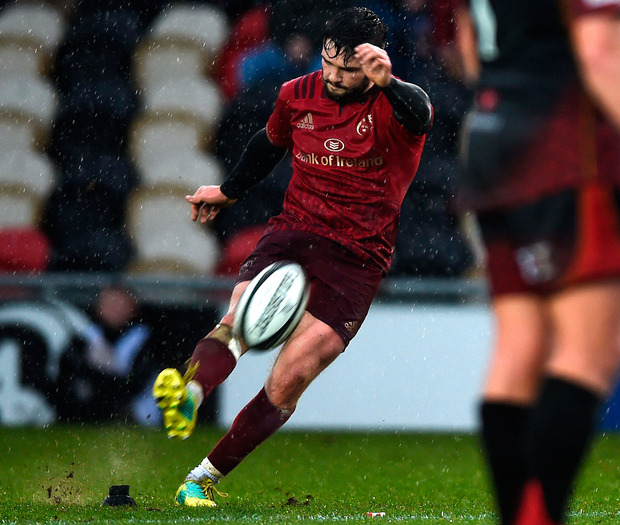 Bleyendaal said: "It was probably not the most exciting match I've ever played in, but there were a lot of pressure points in it and a lot of kicking to try and make the most of the conditions. "It was a grind right until the 80th minute and it was very wet. We haven't played in that type of rain for a while. We played into the wind for the first half and then it switched. It was tough, but in the second half we managed to get into the right areas and then we applied a lot of pressure. "We didn't get the points initially, but we reapplied the pressure. Our set-piece did really well and we went ahead eventually." Dragons - J Williams; Rosser, Morgan, Dixon, Talbot-Davies; Lewis, R Williams; Harris, Hibbard, Fairbrother, J Davies (Evans 64), Screech, Keddie, Cudd, Griffiths. Munster - Haley (Nash 64); Sweetnam, Goggin, Bleyendaal (capt), O'Mahony; Johnston (Taute 64), Mathewson; Loughman (O'Connor 66), Marshall (O'Byrne 59), Archer (Parker 66), Kleyn (O'Shea 71), Holland, Wycherley, Oliver (Coombes 65), Botha.